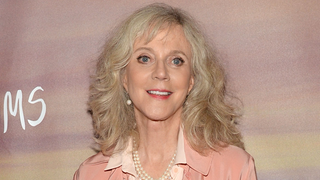 Blythe Danner is currently starring in an indie drama called I’ll See You In My Dreams. Her performance is being praised by most critics, and there’s even chatter about the 72-year-old being an Oscar contender for Best Actress. But what’s most notable about the film isn’t that Danner could receive a Best Actress nomination - what’s most notable is that it’s the first time she’s ever been eligible. This is Danner’s first leading film role. Ever. But you wouldn’t know it reading headlines about her. You would, however, know all about her famous daughter, Gwyneth Paltrow. It’s not uncommon—in fact, it’s quite the opposite—for press coverage to focus on the personal lives of a movie’s stars. (The best things to come out of Jake Gyllenhaal’s Southpaw press tour, for example, were his opinions about the moon.) Gwyneth Paltrow is interesting to people, myself included. Relationships between mother-daughter actresses are interesting to people, myself included. But there’s something about Danner’s case that’s particularly upsetting. Danner has spent her career in the background. The neighbor in this. The mom in that. Though being second (or third) fiddle has brought her success, it’s rarely—if ever—brought her exclusive attention from the press - not as a young woman, and especially not as an older one. If she makes headlines, she’s usually sharing them with someone else. But now, after spending an entire career in supporting roles, Danner is starring in a critical darling that might even (knock on wood) lead to her first major nomination. Here’s a woman who persevered. Here’s a woman who’s part of a wave of older actors showing Hollywood that audiences do care about them. And what does this fascinating woman with an inspirational story that transcends entertainment news get asked about instead? Goop. So let’s talk not talk to Blythe Danner about Gwyneth Paltrow anymore. Let Gwyneth talk about Gwyneth. (She is great at it.) Danner has been sharing the spotlight for 47 years, and it’s about time we let her have it all to herself.